Pray for me that I may have something of your confidence in the loving promises of our God. Pray that I may live my life in union with God’s plan for me, and one day see the Face of God who you so ardently loved. 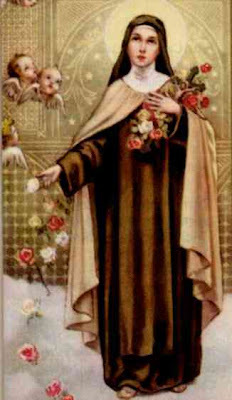 Saint Therese, you kept your word to love God and to trust the world to that loving providence. Pray for us that we may be faithful to our commitment to love. May our lives, like yours, be able to touch the world and bring it to peace. Loving God, you blessed St. Therese with a capacity for a great love. Help us to believe in your unconditional love for each of us. Loving God, you loved St. Therese’s complete trust in your care. Help us to rely on your providential care for us in each circumstance of our lives. Loving God, you graced St. Therese with a capacity to see your hand in the ordinary routine of each day. Help us to be aware of your presence in the everyday events of our lives. Loving God, you taught St. Therese how to find a direct way to you through the “little way” of humility and simplicity. Grant that we may never miss the grace there is in humble service to others in family and neighborhood. Loving God, St. Therese experienced each day as a gift from You, as a time for loving and through others. May we, too, see each new day as a single moment of saying yes to Your will in our lives. Loving God, St. Therese offered to You her frailty and powerlessness. Help us to see in our weakness and our diminishments an opportunity for letting Your light and Your strength be all we need. Loving God, You shepherded St. Therese with a gracious love and made her a tower of strength to people who had lost faith in You. Help us to be unafraid to pray with confidence for the many in our culture who do not believe they can be loved. Loving God, St. Therese never doubted that her life had meaning. Help us to understand our possibilities for loving and blessing our children, our elderly parents, our neighbours in need, and for priests throughout the world. To conclude this novena: Recite one Our Father, one Hail Mary, and one Glory Be. Thank you for posting this! I have left it as unread in my Reader so I would remember to come back every day. Novenas are kind of a new thing to me and I'm finding how much I enjoy them! I am thankful for this novena. I am really excited by its outcome. I am sure I will receive a flower from St.Therese soon. God will receive our prayers through the intercession of His saint.